Street parking after 7 pm. Parking Garage directly across the street at a special rate of $15 for 3-Hours Please have parking ticket validated by the Hostess. Our private room seats parties of 8-10 and our mezzanine level can accommodate up to 85 guests. Extra Thick Canadian Bacon 1 Pc. Loved this restaurant. The service, food and hospitality were fabulous. We had the Porter house for 2 which was cooked to perfection and definitely our best steak of our week holiday. Friendly servers and not too noisy, just some gentle 80s music playing in the background which was good for us Brits! If I have any small issue it was that the menu was overpriced. There needs to be a few more reasonably priced dishes on the menu. The wine list was confusing and the prices ranged from $4,ooo to $60. We chose a $60 bottle of red and it was good. But I think the wine menu needs an overhaul to make it less confusing. Maybe a house red and white at the front of the wine list.... Then if customers want to delve deeper into the wine list they can go for the pricier options. We would definitely recommend Staghorn, but I think it needs a Gordon Ramsay style overhaul to make the menu and wine list more appealing to the regular customer. It was quiet on a Saturday night which surprised us as it’s very good, maybe a few tweeks will improve its popularity. We liked the less busy and quiet ambience. So don’t want it to change too much! Ok restaurant. Nothing wrong with it. I would go there if I have to. Excellent quality steaks & outstanding sides. Showed up for a 9:30 PM reservation. They hand out menus and say to "order quickly, we close at 10:00. "WHY WOULD YOU BOOK A RESERVATION AT 9:30 THEN??? Food was exceptional. Service was superb. Far superior to other very busy steakhouses in the area. Staghorn is spacious by NYC standards. The waitstaff was uneven in their attention to our table. Our drink order was incorrect and our waiter attempted to correct the situation by bringing 3 small olives on a wooden stick. Our steaks were tender and served as ordered however there was very little flavor. It was an unnecessarily rushed experience which could be greatly improved with a different management approach. Very nice small steakhouse near Penn Station. The owner was very inviting and made several appearances around the restaurant, including making some great wine recommendations. The bartender is a Class A martini maker!!!!! Good food well cooked (portions are huge!) - expensive and wide ranging wine list. Deep pocket required. On a positive note, the Maitre De & waiters were very professional, attentive & responsive. The tables were spread out & we enjoyed the extra space not typical of most NYC restaurants. Beyond that, my steak was undercooked & overpriced. My wife’s shrimp entree was not edible. Staghorn Steakhouse was worth a try but we won’t return. Loved the menu, really enjoyed the food and quick service if you need to get to a show. Was pleasantly surprised. Will go there again! We were very impressed with the great food and service at Staghorn! The steaks were delicious, lamb chops melted in your mouth! 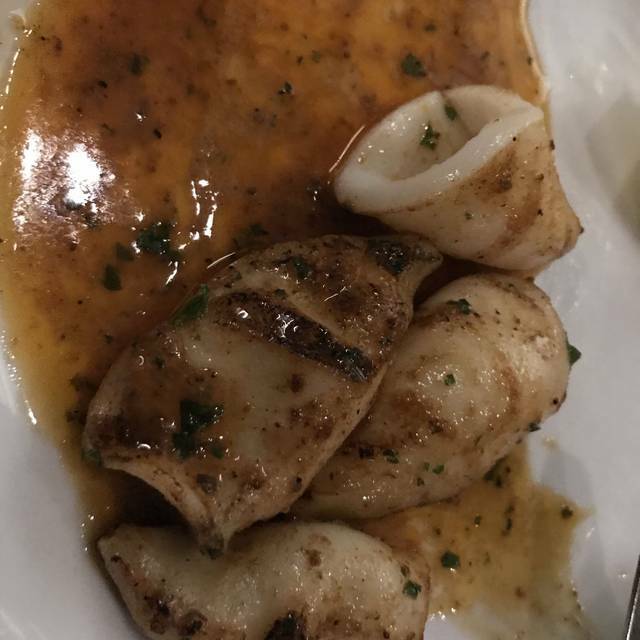 The grilled calamari was outstanding and the fresh mozzarella was the best we ever had! Our waiter was great, very attentive and friendly and knowledgeable about everything that was on the menu. We will definitely be back! Service is great, this is an up and coming area of lower midtown, nice atmosphere and the food quality is top shelf. Haven’t had a Manhattan in along time, the BT makes a great Manhattan - I had two. Can’t go wrong with this place that continues to go “under the radar” of great places to dine in the area. Great food and attentive service! What a great meal. Service was wonderful. We would definitely go back soon. Shockingly bad and shockingly overpriced. Embarrassed for them. If you’re looking for excellent steakhouse food - this place doesn’t disappoint. 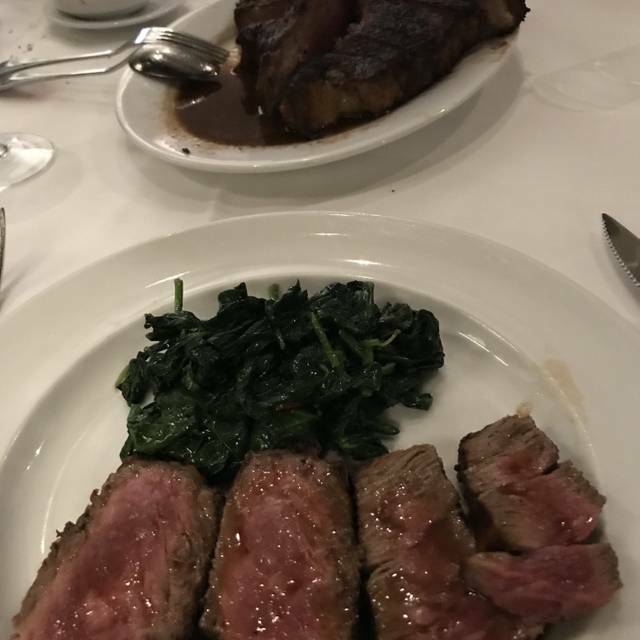 It is quieter than the usual suspects on the steakhouse circuit, so if you want to have a working lunch or dinner where you can actually hear yourself. If you want to have phenomenal food without yelling to be heard, this is the place. It’s a quiet gem, and I recommend it to everyone. The staff is excellent, and there’s never a no for whatever request you make. Great wine selection as well. The service, food and overall experience was awesome! Would recommend for both business and pleasure dining! Nice looking place but lousy ambiance. Great Steak cooked to perfection. Quite enough to have a business discussion. I've enjoyed The Staghorn Steakhouse numerous times over the years. Great place for a business lunch as the noise level is very low. Service is impeccable and very professional. The food is exceptional. List of "bar food - appetizers" are plentiful. The Steak on Toast is terrific as an appetizer and don't miss the onion rings! Steaks are perfectly grilled and served the way you ordered. I've stopped in for a Happy Hour drink and the place is hopping. I've been to other "big name, big box, open since 1895" type steakhouses, but the cuisine, atmosphere/ambiance is totally different.. The Staghorn has more a private club feel. I've noticed that Management and servers greet many guests by name, definitely a good sign. Very friendly place. I have never been disappointed, be it for a business lunch, quick drink or dinner. BTW... I have never been rushed at The Staghorn...even when a business lunch lasted almost 3 hours or just lingering over the last glass of wine! Try that in other steak houses. It was a great meal, great food and great drinks. Not very crowded so very attentitive. Good food. Efficient knowledgeable staff. Lack luster decor and atmosphere. I’m sad to say the food was a major disappointment. The filet was chewy and so was the sea bass. It was terrible. There were only 3 other people there and now I know why. The waiter couldn’t have been nicer but that’s likely because they are desperate for customers. Excelente Servicio .. La Comida era aceptable , pero no acorde la relacion precio - calidad. The food and ambiance were fantastic. We will definately be back! Great food, great staff. Would definitely go back and recommend to a friend! Great food and a hidden gem. Nice little gem in NY. Excellent steak! I love this place. The owner plays an active role in assuring that everyone of his patrons are being taken care of and are happy with everything. My GF wanted steak and I searched for a steak house around Penn Station and that is how I found Staghorn. I will definitely be back and will be telling everyone how great this place is. Over cooked the steak, but the service was great. Service was spot on! They were very attentive & made us feel like they truly cared about our experience. Steaks were great & the dessert, tiramisu was amazing! Another fantastic meal at Staghorn. I went there with my brother on Friday night, as we like to do every couple of months. Had the porterhouse for 2, which was cooked to medium-rare perfection and could have easily fed 4. For sides, the creamed spinach was excellent and the crispy hash browns are a must. Add a martini and a glass of cabernet and the dinner is a 10 every time. Highly recommend. Great appetizers and steaks. Very attentive service, quality big screen projector for the game. Walked in.. no ambiance. Nice wine list but really only one available? Five of us had dinner.. we did order a seafood tower so that was pricey. I had only a lobster bisque for dinner and my husband only had a mozzarella appetizer for dinner. We had filled up on appetizers.. bill was almost 700... not worth it. We dine in steak house often. Very disappointed.